HomeBloggingDoes SteemPress confuse Google? SteemPress and SEO! I am using SteemPress to publish WordPress posts automatically to Steemit. But, I have always been a bit scared to publish the same material to several platforms, because who knows, maybe Google will punish me somehow. I have recently tried publishing content on Medium and Steemit, in addition to originally posting my blog posts in my WordPress blogs. Now, I have done this for more than a month without actually paying attention to the results and if there has been any consequence. But, today I did a short test with a couple of articles I have published with SteemPress. The most important part of publishing on other platforms is that you do not want Google to index articles more than once, and it is important to let Google know where the article has been published originally. If not, Google could suspect your WordPress blog (the place you published the article originally) to be a copy of the article published on Steemit (or Medium). So, that is what I tested today, and this was the outcome. A few weeks ago, I published an article about a day-trip I did to Brno not long ago. It was a great success on Steemit, and I even won some awards for it. 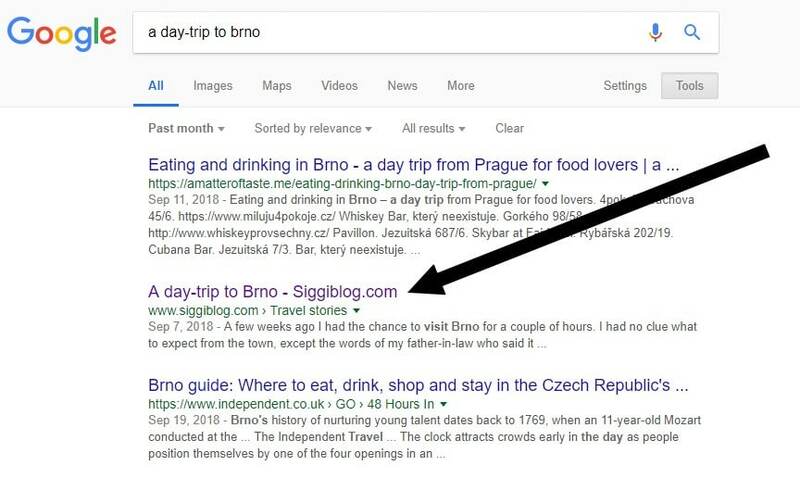 Today, I decided to do a Google for a “day-trip to Brno” to see if Google has indexed anything at all, and if yes, which article(s)? Unfortunately, my blog hasn’t got a great Google ranking, so there are lots of results that ended up before me. But, then I shrank the search results to articles published within the last month. And that is when I saw the following results. I found my original article in the Google search results! If you see the picture, you will notice that the original article published at siggiblog.com was found in the Google search results, and not the Steemit article. And yes, that is exactly how things are meant to be. Since SteemPress include a short link in the bottom of the published articles back to the original article, Google should understand that the Steemit article is simply a copy of the original article. But, I still had my doubts about this, and that is why I tested it. Why did I have my doubts? If you re-publish articles on Medium using different WordPress plugins, you will notice that it changes the canonical URL tag in the HTML code. This is a way of telling Google that the canonical URL of the article is a different one than the Medium article. That is, however, impossible to modify on Steemit, meaning that Google isn’t told by default that the article has been published somewhere else. For this reason, I was a bit skeptical. I have done the same test as above on several other articles since then. The result has been mostly the same on all occasions, meaning that the original blog post is showing up in Google search results, and not the “copied” Steemit article which has been published using SteemPress. But, there have been some exceptions as well, meaning that the Steemit article shows up in search instead of the original blog post article, when I search for the same topic, just using different words. And since Steemit has a much better domain ranking than my own domain, Google decides to show the Steemit article instead. But, is that dangerous or not? Searching for the original blog URL, the result will show up. Search for the Steemit URL, the Steemit result will show up. Search for the Medium URL, the URL of the original blog post will show up. In other words, Google does index the Steemit articles published with SteemPress, and it will/can show up in search results, if Google decides to do so. Whether or not this is harmful is unknown to me, but I do believe the returning URL in every SteemPress published post should make it clear that the original article is the one Google should award. What is my SteemPress conclusion? So, maybe Google will find the Steemit article to be more appropriate at some times and show that instead. Doesn’t seem so harmful, does it? Maybe publishing with SteemPress will actually bring you more readers in total? I am not a professor when it comes to SEO and duplicate content, but based on what I have read, I do not believe using SteemPress can harm you, but instead it has the great potential to bless you (both with new readers, and financially, as you receive upvotes and support from readers on Steemit). Have you used SteemPress yet? Do you have any positive or negative experience with publishing the same content on several platforms? WordPress says I have comments awaiting moderation, but they do not exist!